So, is it time for a healthy portion of crow? 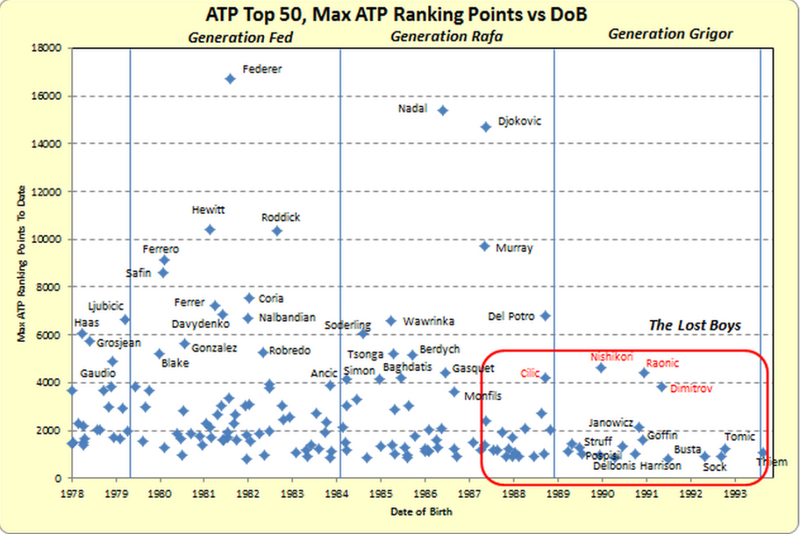 For much of the last year, I’ve been banging on about the coming ATP Dark Age. When the Big 4’s death grip on the 4 major tournaments was finally broken for the first time in 17 tournaments, it was a grizzled 29 year old veteran, Stan Wawrinka, who found himself blinking in the Melbourne flash bulbs. Then Wawrinka and Jo Wilfried Tsonga helped themselves to Masters 1000s titles at Monte Carlo and Toronto, but the other five went to the usual suspects – Novak Djokovic, Rafael Nadal and Roger Federer. The US Open ATP semifinals promised more of the same: a repeat of the Djokovic-Federer five set classic Wimbledon final was penciled in by most tennis watchers. But Marin Cilic and Kei Nishikori didn’t read the script: so on Monday afternoon those two, the no 6 and no 12 seeds played the championship match, the first since the Hewitt-Safin 2005 Australian Open final not to include Djokovic, Federer or Nadal. 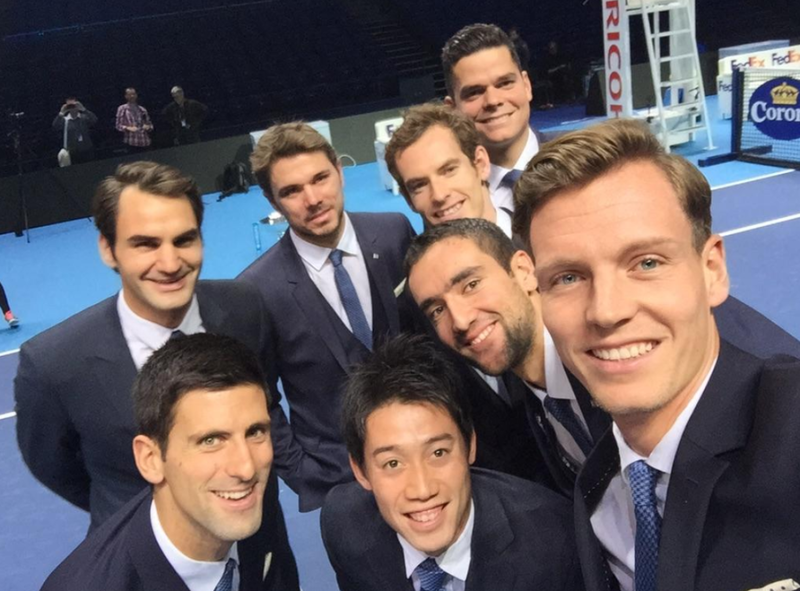 Nishikori and Cilic are first timers at this week’s 2014 London World Tour Finals. And they’re joined by Milos Raonic, who at 23 becomes the youngest finalist since Juan Martin Del Potro made his WTFs debut at the age of 21 (Nishikori is 24, Cilic 26). Earlier this year, I coined the term #TheLostBoys to describe a missing generation of ATP players. Now three new players, including one born in the 1990s, are competing for the ATP year end championship. Is it time to retire the hashtag? No. No, no and no. #TheLostBoys are still – like a Coldplay album – a disappointing shadow of what has come before. In my February post at the Changeover, I highlighted Grigor Dimitrov for two reasons: first, because as a first time quarterfinalist at the Australian Open he’d attracted a lot of buzz, and because he was in the middle of the group of players who followed Generation Rafa. Dimitrov went one round better at Wimbledon than he had in Melbourne, as did Raonic, who’s also a member of Generation Grigor. In New York, Kei Nishikori was the first Generation Grigor player to make a Grand Slam final, but he fell to Cilic – like Wawrinka, a Generation Rafa late bloomer. How has the plot changed since then? You can see that Nishikori, Raonic and Cilic have crossed the 4000 ATP Ranking Points threshold, and Dimitrov has flirted with that level. None of their peers has remotely threatened to make a breakthrough in 2014. As a cohort, the Lost Boys are still deeply disappointing. So far, only four players born after Novak Djokovic have crossed the 4000 point level – Del Potro in 2009, and Cilic, Nishikori and Raonic in 2014. Generation Fed had 13 players above that mark: the first was Lleyton Hewitt in June 2000 at the age of 19, the last David Ferrer in August 2007, aged 26. The average age of Generation Fed players when they made their breakthrough was just under 23: two (Hewitt and Andy Roddick) were teenagers. Nadal, Djokovic and Andy Murray also crossed the 4000 point level as teenagers. Like Generation Fed, Generation Rafa has 13 players who have had 4000 or more ranking points. Nadal was both the first to reach this mark and the youngest (the only player under 19). Cilic (26 in September 2014) was the latest: the average breakthrough age for Generation Rafa is 22.5 years. Roger Federer has been trying for a while to tell us that age is just a number: maybe Generation Grigor is a group of late developers, who will sweep all before them in the next five years? It’s possible that Stan Wawrinka and Marin Cilic will go on to be multi Slam winners. But they’ll be bucking a trend if they do so. Since 2000, the new players who’ve contended in more than one Slam finals have been Safin, Hewitt, Ferrero, Federer, Roddick, Nadal, Djokovic, Murray and Soderling. 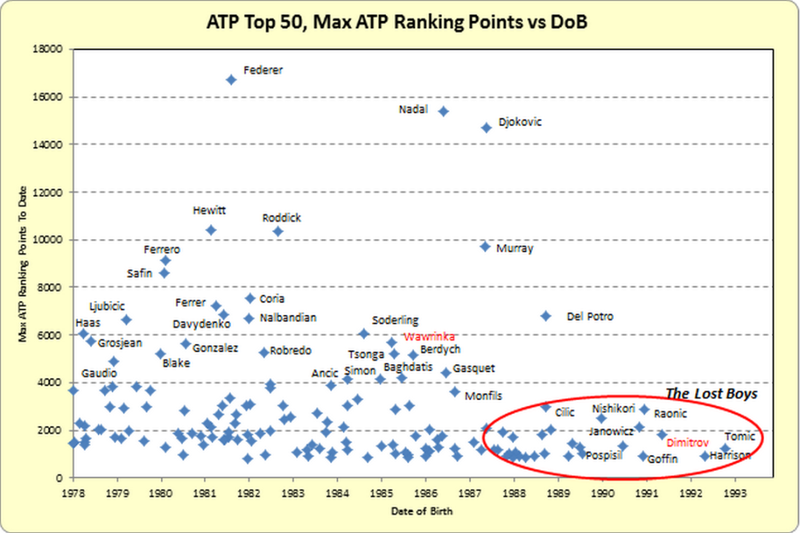 All, with the exception of Robin Soderling, cluster in the top left corner of the chart. 7 of the 9 players made their breakthrough before they were 21, and reached a level twice as high as the current best of the Lost Boys. Twenty-three players on the chart made their breakthrough after the age of 21: of these, two (Ferrero and Soderling) played in more than one Slam final, and ten (Nalbandian, Coria, Gaudio, Baghdatis, Gonzalez, Tsonga, Berdych, Ferrer, Wawrinka and Cilic) have played in one. None of the 23 who broke through after the age of 21 has won more than one Slam: six of the players who broke through before 21 have done so (Hewitt, Safin, Federer, Nadal, Djokovic and Murray). Generation Fed is getting long in the tooth, with only Federer and Ferrer still challenging for the big titles. Generation Rafa will begin hitting the buffers in the next two or three years. Will Nadal, Djokovic and Murray continue to pad their resumes, with the now retired Federer watching, smiling gamely from the Royal Box at Wimbledon sitting next to Rod Laver, Bjorn Borg and Pete Sampras? Will Borna Coric, Nick Kyrgios or their peers be lifting the big trophies by then? Or will the Lost Boys finally come into their own? It’s still possible that a Dark Age can be averted, but the odds are lengthening. From where I sit, it looks like the meek will indeed inherit the earth. 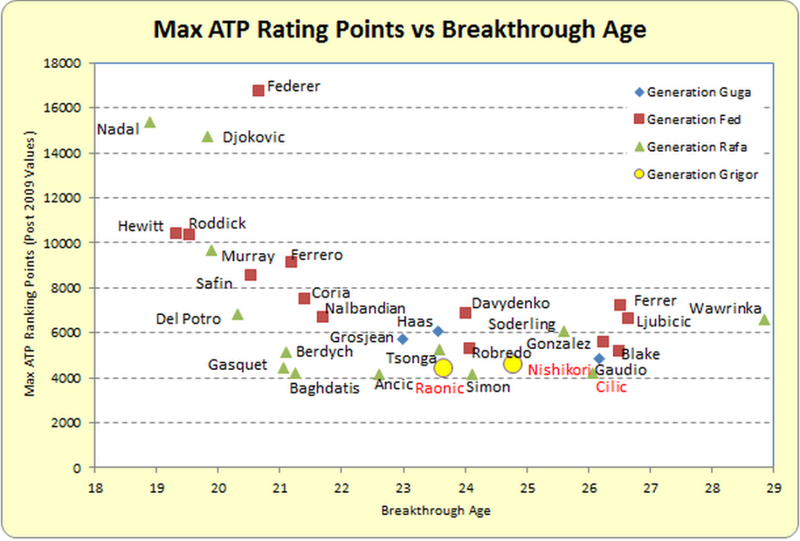 Good Analysis…note that Max Points at breakthrough age over the past 5 years is skewed because the the Big Four dominate the available Points possibly like no other 4 in history. Another way to look at this (not yet, but maybe end of next year) is the H2H records of all the Inheritors (Raonic,Kei,Dimitrov, Cilic and anyone else who emerges in next 12 months) vs Fed/Djoko/Murray/Nadal. I believe the H2H will be shockingly lopsided in all cases. It’s possible that NONE of these inheritors will be a dominating force over the next 3 years. Is it fair to ask if the more accurate focus should be on the dominance of Federer/Nadal/Djokovivc/and-to-a-lesser-degree Murray, rather than on the poor results of #TheLostBoys? I don’t know that we can find a similar list of stellar results in mens’ tennis – short of the more closely circumscribed Rod And Kenny Show of the 70s – suggesting that the Lost Boys aren’t so much lost as the Big Boys are really, really big in a unique way. Having said that, I can’t say I’d be a happy camper if I’d had tickets for the first 2 days of the o2.